Have you ever wondered, "What should I do with this massive 12 x 12 cardstock sticker sheet?" It's just so large and pretty and has more than the lion's share of stickers on it. AND, It's almost too pretty to peel the stickers off of it! But, peel we must and today I would love to share an idea for using up those stickers in your titles. The Generations Collection is not only great for Thanksgiving projects, but I used it for a Valentine's Day Layout. I had a hard time finding a die cut to showcase the Designer Cardstock paper for this collection because I did not want to cut off the beautiful flowers in the corner of the paper, but I also wanted the gingham design to be a strong background paper. So, I went a little wild and took some scissors (yes, I said scissors) and hand cut my own die cut. I rather like the effect, but you be the judge. It's fun to use some of the Generations 12 x 12 Expressions Cardstock Stickers along with the 12 x 12 Fundamental Cardstock stickers to create a clever title. I was so smitten with the keys, that I had to use one in the title. Plus it was fun to mix the different sized letters from the collection to draw interest to the title. The different sized hearts overlap beautifully to finish off the sentiment. Add pop dots to your stickers for dimension and interest. I added them to the polka dot scallop so it would show up more on my page. Then I pop dotted the little tree and overlapped it with the heart and ticket stickers. Personalize your page with some of your own handwriting. I rarely write in cursive anymore, because my printing is easier to read, but I went a little old school and added the date in cursive. I also used the 12 x 12 Expressions journal strips to add a sentiment and pop dotted them to stand out on the page. Welcome Back! We are so excited for the Holiday Season and our exclusive gift guide that will be available here on the blog on December 2nd. The 25 Days of Christmas collection can be used in so many different ways! Here Simple Stories owner Amber Crowell has created a beautiful home décor item to display during the holiday season. Simple, easy and elegant – trim one of our 6x8 element pieces, ink the edges, add a few pop dots with our fundamental stickers and a ribbon and you’ve got a fabulous home décor item perfect for gift giving or display in your own home! The 25 Days of Christmas elements are perfect for quick, easy and affordable gift tags! Simply trim the beautiful flashcard page, ink the edges, add a little creativity and ribbon and all of your gifts will have that handmade look you’ve always wanted! Be sure to stop back by tomorrow for more sneak peaks into our fabulous gift guide! Remember to leave a comment to qualify to win your very own 25 Days of Christmas collection kit! Cooking Up Cards Class Winner! Yay! April! Email me your email address, April at scrapally@gmail.com ! I'll hook you up with the BPC folks for your free class! This week is going to be oh so fun with so many holiday gift giving ideas and ways to decorate your home for the holidays using our Simple Stories 25 Days of Christmas collection. We will be posting a few sneak peeks of the many ideas that will be included in the holiday gift guide on Friday. We will also be giving away a free 25 Days of Christmas collection kit to a random winner this week. To enter Simply leave a comment each day this week on our blog. We will announce the winner next Monday, December 5th. The first project we want to share with you is very simple and quick. All you need is a beautiful 4x6 frame, and one of our 4x6 cut apart elements. This project will take you less than 2 minutes, how is that for a speedy holiday project? If you have a little bit more time, simply grab a 7 Gypsies artist tray, our Simple Stories 25 Days of Christmas flash cards, designer cardstock, and the fundamental stickers to create this beautiful project for your home. Make sure to stop by tomorrow for more fun ideas, and the full Holiday gift guide reveal on Friday. Happy Black Friday to everyone! Oh my, was the shopping crazy this morning! Yes, I was out in line at midnight, but I am happy to say that I survived and crossed quite a few things off my shopping list at great prices! I am still crazy in love with the new Year.o.graphy line! It is so compatible with so many themes and occassions - it is definitely the line I am reaching for most often these day! Today I'm going to share a couple more layouts created with it - check out how versatile it is! As you can see, everyday moments are my favorite things to scrap about and this line is perfect! Be sure to check back starting Monday to Celebrate the Holidays the Simple Stories' way! The count down is on and tomorrow most Americans will be in the kitchen making a plethora of mouth watering pleasures. Family will arrive and the tradition of celebrating what you are grateful for commences. I thought it appropriate to make a card to celebrate the holiday. Of course I had to use the Simple Stories Generations collection, which is perfect for this time of year. The card was also inspired by the talented Allison Landy's sketch from her Big Picture Class called Cooking Up Cards. See the post from Monday for more details and a chance to win some goodies! I like to make 6 x 6 square cards, so I took the foundation of Allison's sketch and adapted it to my own style. There is just something about slicing cardstock in half and using all of it to create a card that makes me feel happy. You can see the rich colors of the Generations Collection are perfect for the sentiment and time of year. I primarily used the Generations 6 x 6 patterned paper pad and the 12 x 12 Fundamental Cardstock Stickers. I recently found a cute craft store near my home which sells all kinds of knitting and embroidery supplies and picked up this gorgeous velvet fiber to finish off my card. Simple Stories and BPC Giveaway! Hi Simple Stories Fans! Allison here with a very special post and giveaway. Big Picture Classes is a great place to learn and share our love of creating everything from scrapbooking to a better designed healthy body. I recently had the chance to team up with 3 of my favorite designers, Kim Kesti, Betsy Veldman, and Teri Anderson to create a fun, self-paced class called Cooking Up Cards! The class is a fun way to get inspired and make a ton of cards on your own. Each class "chef" created a card recipe just for the class and created a ton of sample ideas with each recipe too. Here's a tiny peek! So, we thought it would be fun to showcase how you could take this class and use Simple Stories products while you're at it. Simple Stories makes card making so easy, especially now with the 6x6 pads of paper! The smaller elements are perfect for using on a card. Here are two cards I came up with using my card recipe from the class. Happy Day is the perfect birthday card set. I took the sentiment from the 6x6 pad (see I told you they were perfect for cards), added some border stickers and ribbon, and voila! all done. Quick and easy. How much do we love those photo transparency overlays? SO much! A little ribbon as the final touch and again, very quick and easy. So, if you want a way to combine quick and easy card making with the beauty of Simple Stories, just leave a comment here and we'll pick a winner to receive a FREE COOKING UP CARDS class! And stay tuned for Liz who will be sharing her version of the recipe using the Generations line tomorrow! First thing you do is print off the pattern from the website. Then use a removable adhesive to attach the pattern to your papers. Our Generations line is perfect for Thanksgiving festivities, don't you think? The pattern has directions printed directly on the paper, all you need are scissors, a scoring board, and some liquid adhesive. Follow the directions and you've got a gaggle of holiday birds directing your guests to their spot at the table! It has been a while since we have had a guest designer on our Simple Stories blog, so I was excited when I was asked if we ever had guest designers from one of our CHA blog winners; and after looking at her fun blog, I knew she would do a great job! I am very excited to introduce you to our guest designer today; Heather Leopard. "I am honored to be guest designing for Simple Stories. I'm a mommy to two beautiful girls and a great step-son. I have a wonderful hubby of 9 years who supports my crafty side! When I'm not working or playing with the family, I can be found crafting in my scrap room. I’ve been scrapping since 2002 but I got serious about it in 2010 when I realized the photos in my computer weren’t telling much of a story. My style is eclectic a.k.a random. I have no other way to describe my style because I feel that if I do I will limit myself. Instead, I go where the pictures, paper and embellishments take me. In saying that, I have seen a pattern: plenty of color, lots of layering, machine or hand-stitching and fussy cutting any chance I get. I include hand written journaling on all my layouts. My journaling is more than stating the facts; it's about the emotions and what's in my heart. My other obsessions include being a HUGE Rob Thomas/Matchbox Twenty fan as well as diving all over the world, even when it means a random encounter with hammerhead and nurse sharks…Yikes! I’ll admit it…I’m kind of a paper snob but the Simple Stories colors and patterns are simply amazing. I love that they are double sided and so versatile, allowing me to really stretch my stash! I also love that they have designed the collections with every scrapbooker in mind, with gorgeous papers, journaling spots, title elements, embellishments (including heavy stock stickers) and alphas. Everything I needed to complete my projects was at my fingertips. Simple Stories makes it really easy for me to document and share my life memories. Thanks for having me!" The first layout that Heather created for us comes from our Baby Steps collection. This is the perfect layout for those small ultra sound pictures from the doctor. This next layout was designed with our Happy Day collection, I love how versatile this collection can be. Also from our Happy Day collection is a fun gift holder card. This would make anyone smile on their special day! To see other creations from Heather visit her blog The Spotted Leopard. Also, make sure to stop by next Thursday as we get ready to celebrate Thanksgiving; what better time to highlight our Generations collection as we get together with our families? 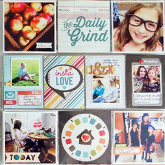 Heather created 3 beautiful layouts using our Generations collection that you won't want to miss! Thank you for stopping by today; and thank you to Heather for letting us highlight some of your beautiful work on our blog today!